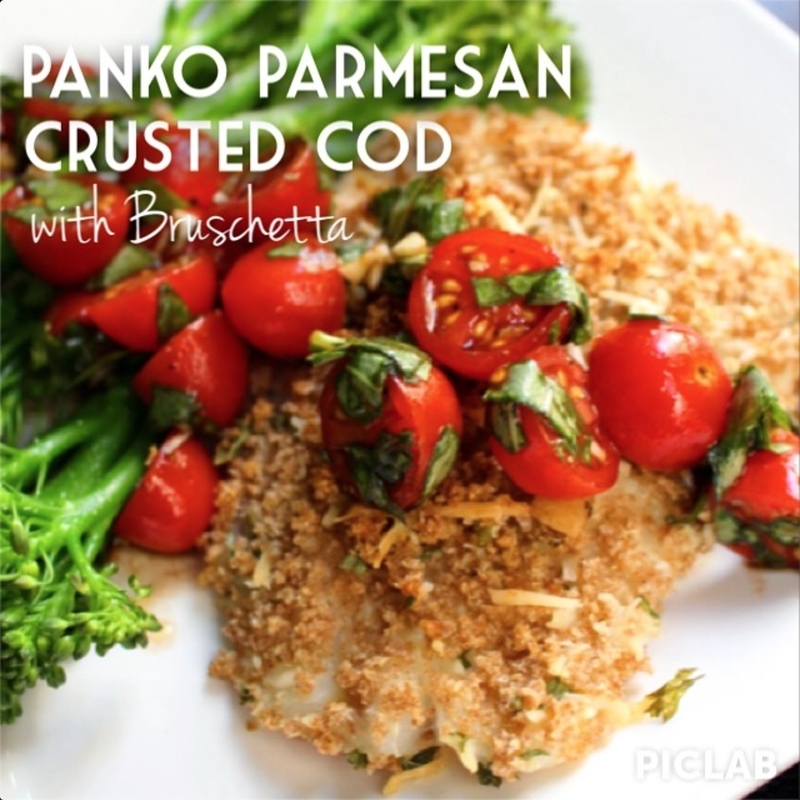 A perfect change of pace and a little Italian twist on eating fish! Using a lean, firm white fish means it can handle the rich flavor of the balsamic vinegar and basil in the bruschetta. Delicious dinner! 1. Combine cherry tomatoes, basil, garlic, balsamic vinegar and olive oil. Refrigerate for at least 30 minutes. 2. Pre-heat oven to 400 degrees. Line a baking sheet with a silicone baking mat. 3. Lightly beat egg and pour into a shallow bowl or plate and add a splash of milk. In another shallow bowl or plate, combine panko bread crumbs, Parmesan cheese, garlic powder and parsley. 4. Dredge cod fillets in egg, then the panko mix until well coated. Place on baking sheet. 5. Bake at 400 degrees for 12-14 minutes or until cooked through and fish flakes easily. Then broil for a few minutes to brown the bread crumbs, watching carefully so it doesn't burn. 6. Serve fish with bruschetta (and broccolini if you like).